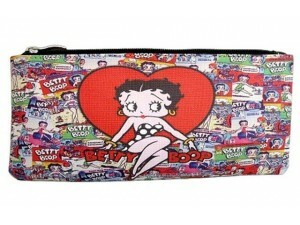 This is a beautiful brand new Betty Boop large cosmetic / make up bag, It measures 9-1/2" wide x 1/2" deep x 4-3/4" tall. I'ts made of synthetic leather, and has a top zippered closure. Please check our categories under the listing of Boop make up bags for additional items. All international Buyers are responsible for the payment of duty & taxes to their custom's agency. If you have any questions, please either email us at boopstuff@aol.com, or call our office at 352-237-6666.